Well it’s been a minute since I started this round of Making it Yours. Let’s catch up! 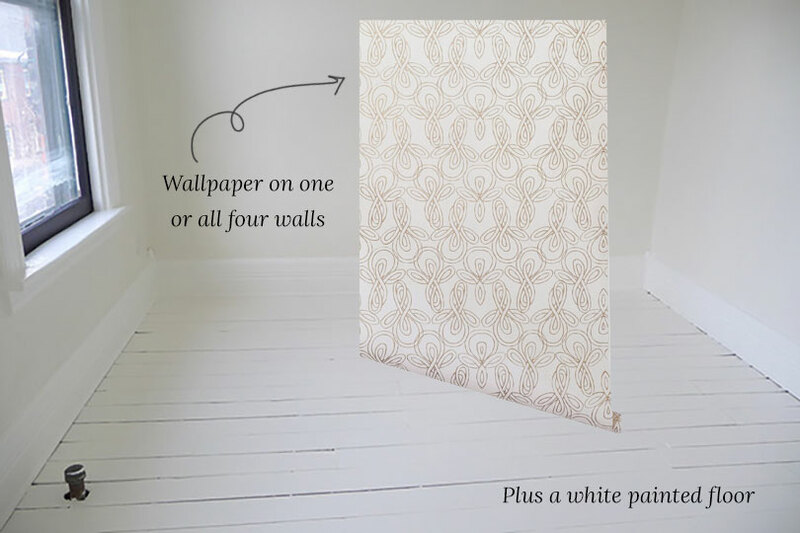 The idea behind these MiY posts is that we do not decorate our homes from scratch. We incorporate new pieces that we love, and over time we make those pieces work as our tastes or circumstances change. 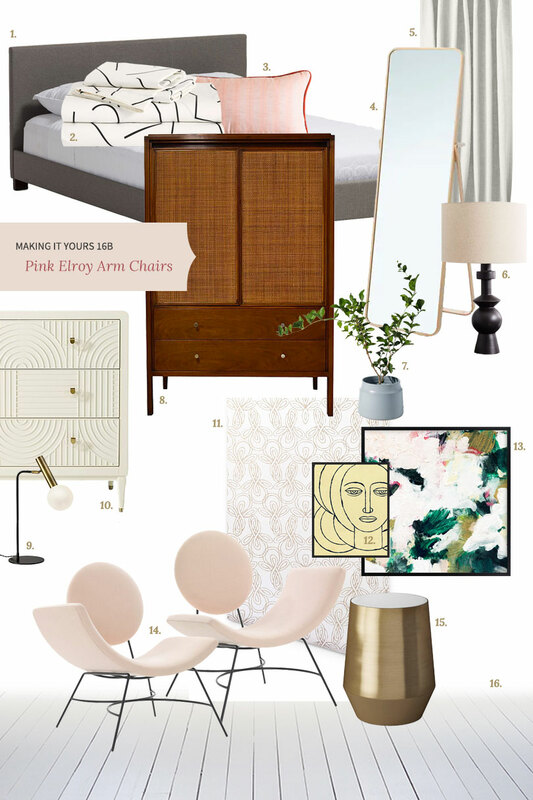 This time around, we’re working with a pair of pink Elroy chairs. They are completely of-the-moment trendy, so how do you work with them when you fall hard but don’t want to regret purchasing them in a year or two? 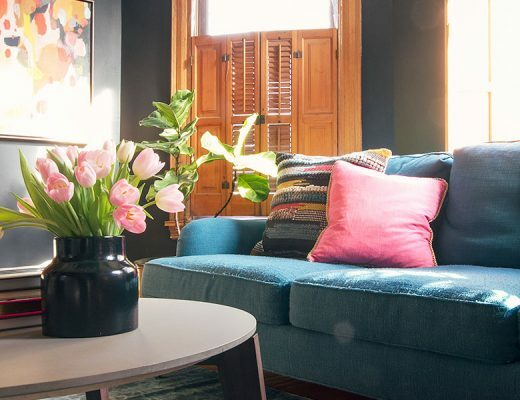 How do you incorporate them when the rest of your furniture may be kind of basic and not a match, style-wise? We’ve already seen them in a living room design with a tailored sofa and boxy coffee table, and now the chairs are moving to the bedroom with a very plain, basic upholstered bed (which is under $300 for the queen size). Not the most exciting, but a totally fine jumping off point. “Could we add a pair of these chairs?” We could, we can, we shall. We’re also going to reuse the dresser, task lamp, side table, and curtains from last time. I like to do this because it’s how so many of us decorate, grabbing and repurposing from other areas of the house (or from storage). 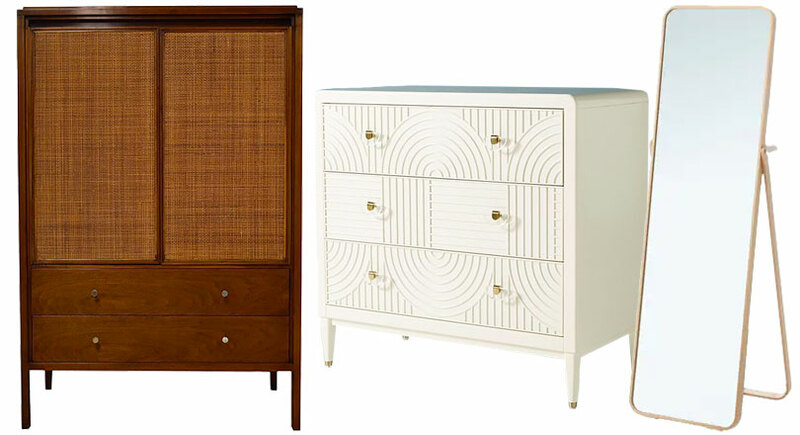 I haven’t been particularly drawn to mid-century modern lately, but the dresser’s lines fit the style nicely while being updated with the geometric overlay, making it a good match with the chairs. 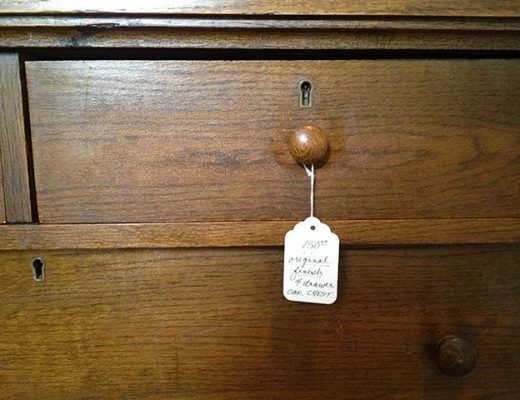 I imagine the room with a vintage wooden wardrobe or highboy like this Paul McCobb “Gentleman’s Chest”. (This is a particularly nice option, but there are plenty with similar lines to be found locally across the country for less.) I also added a full-length mirror with simple curves. I would keep the shell of the room light, but that doesn’t only have to mean white walls. A wood floor painted white would be perfect here, and I’d add wallpaper with a light base and loopy pattern (even if only an accent wall, which I don’t normally recommend). From there, I added art, bedding, and accessories. Below are links to everything with a quick explanation of what drew me to each item. An upholstered bed in a neutral color is a great base to start with. This one is simple and affordable. The lines remind me of deconstructed Keith Haring figures. Is it just me? Barely there stripes with a great orangey red contrast welt. I would love to see the frame painted, but it’s pretty in the natural ash too. There’s a bar behind the mirror to hang your clothes on. Smart! Can’t beat these for the price. Among IKEA’s best curtains. I was between this and the smaller, white version, but ultimately preferred the black graphic punch of this one. Super into that shape and color. Luxe vintage. Plenty of local alternatives in your area (as mentioned), I’m sure. Craigslist or FB Marketplace will be your friend. So little! So cute! So angular! I wanted this when I first post it and I still do. Just so dang well done. The pattern has a nice repeat, reading as a subtle background with more interest the closer you get. She reminds me of the Queen of Hearts from a standard deck of cards. A pretty abstract is always nice. I would choose this as a canvas print. A nice alternative to the ubiquitous drum cylinder that works in almost every sapce. When I thought of including a painted floor, I immediately thought of Anna’s! The floor board gaps and inconsistencies are wonderful details to embrace, especially in older homes. All right, where to next? I’m working on the third and final look for the Elroy chairs now to be ready on Wednesday! I love it! Point well taken — decor is a layering on process, not one big haul from a store you like. I love the modern style of the chairs in the super on-trend color woven in with the existing armoire. They look great together.